Cambridge University Press, 9781107661363, 540pp. Although the ability to retain, process, and project prior experience onto future situations is indispensable, the human mind also possesses the ability to override experience and adapt to changing circumstances. 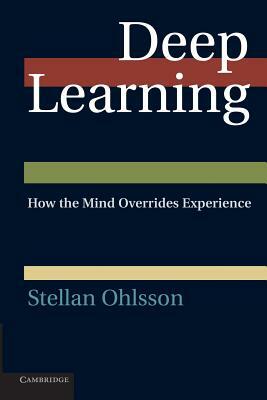 Cognitive scientist Stellan Ohlsson analyzes three types of deep, non-monotonic cognitive change: creative insight, adaptation of cognitive skills by learning from errors, and conversion from one belief to another, incompatible belief. For each topic, Ohlsson summarizes past research, re-formulates the relevant research questions, and proposes information-processing mechanisms that answer those questions. The three theories are based on the principles of redistribution of activation, specialization of practical knowledge, and re-subsumption of declarative information. Ohlsson develops the implications of those mechanisms by scaling their effects with respect to time, complexity, and social interaction. The book ends with a unified theory of non-monotonic cognitive change that captures the abstract properties that the three types of change share.